In early Renaissance Florence, art and finance fed off each other uncomfortably, much like today. In northern Italy in the 14th century, bankers had a problem. With the increasing sophistication of currency systems and the growth of international trade, huge new opportunities were afoot to make money by manipulating money. However, there was a catch: Lending money at interest was against the Catholic religion, whose theologians labeled it “usury,” a sin deserving damnation. Canny financiers with one eye on their coffers and the other on what would happen after they were in their coffins came up with some interesting ways around this impasse. One was to exploit slight differences in foreign countries’ exchange rates to generate returns on investment of up to 29 percent. With this practice—a version of what today would be called arbitrage—they could claim that technically no interest had been charged and thus be off the hook with the Church hierarchy. Another, very different strategy was to launder the lucre by converting it into art. That would have two outcomes. By commissioning altarpieces and other public religious art, bankers like Cosimo de’ Medici could assuage their guilt and at the same time impress their fellow citizens with their piety. Not only that, but by using financial clout to influence the iconography of these works, they could subtly send a message to the populace that maybe money wasn’t so bad after all, spiritually speaking. By making sure that the Virgin was portrayed in sumptuous garments even if she happened to be in a manger, by having themselves painted into holy scenes hobnobbing with saints and angels, and even by putting religious imagery on coins, the wealthy were engaging in highly effective propaganda for their profession. The fruitful if often uncomfortable relationship between art and money in early Renaissance Florence is the subject of “Money and Beauty: Bankers, Botticelli and the Bonfire of the Vanities,” a fascinating exhibition opening this month in that city’s Palazzo Strozzi museum, co-curated by author Tim Parks and art historian Ludovica Sebregondi. Paintings by artists from Botticelli to Ghirlandaio to Fra Angelico (plus a sampling of pictures by non-Florentines such as Quentin Matsys and Hans Memling) are displayed alongside objects like coins, gold-weighing devices and a bale of raw wool, as well as contemporary financial documents, to tell a complex story from a little-read chapter of cultural history. The idea for the show dates back to a book Parks published in 2005 called Medici Money. “Originally I was asked to write this book by W.W. Norton, who were doing a series on money issues,” recalls Parks, an English-born novelist, travel writer and translator (notably of the wonderful and uncategorizable books of Roberto Calasso) who has been living in Italy for the past 30 years. “‘No way,’ I said, ‘too complex.’” But Parks was persuaded, and the book did well. Several years later, the Palazzo Strozzi got in touch with him and asked if he would be interested in collaborating on an exhibition that would essentially illustrate and extend the points he made about money and art in his book. Since Parks is not an art historian, Sebregondi came on board to lend scholarly expertise and use her curatorial connections to negotiate the impressive roster of loans for the show. The exhibition is structured as a “duet,” and the two curators wrote double captions for all the works. Of course, part of the reason it was badly explained is that—then as now—high finance was so complex as to be opaque, at times, even to those who practiced it. And the theology of the thing was no easier. “There was a lot of perplexity on the part of guys in the business as to what was really wrong with money-lending,” says Parks, who observes that even Dante wasn’t entirely clear on the point. In the Inferno, when he sees the moneylenders burning in hell, “Dante asks Virgil what was the big deal with usury.” Parks diagnoses the problem in social terms. First off, by creating a means of storing wealth, the invention of currency also ensured that equivalencies would be established between very different goods and services. “A barrel of wine costs twenty soldi, a prayer for a deceased loved one ten, a prostitute fifteen,” Parks writes in a catalogue essay. “This creates uneasiness. Is a prayer worth less than a prostitute?” And then there was the issue of social mobility enabled by financial liquidity. “Money is just so mobile,” says Parks. “Cosimo de’ Medici had a way of bringing up his lackeys and making them more important socially.” To a world that believed that social position was divinely fixed, the power of money was very threatening. The Churchmen or the bankers—who were the real masters of the universe? Out of this agitation and munificence, some amazing works of art emerged. This exhibition is huge, and some of the pieces, beautiful and impressive though they are, are connected to the theme somewhat tangentially, but nonetheless a clear narrative emerges. Early in the show, the great gold-encrusted Palla della Zeccha altarpiece is on view, with the Virgin depicted wearing a crown. Parks calls this “a common image that the bankers liked, because it was a fusion of righteousness and riches.” The Strozzi show is rich in portrayals of businessmen, such as Tommaso di Piero Trombetto’s 1490 Portrait of Francesco di Marco Datini, the famous “Merchant of Prato” immortalized in Iris Origo’s great book of that title published in 1957. Trombetto’s approach is sympathetic, but most images of business people and especially moneylenders were caricaturish at best until the late 15th century. Maninus van Reymerswaele’s The Money-Changer and His Wife, circa 1540, is “one of the first images where you feel the people aren’t being presented as grotesque,” says Parks. The last section of the installation is concerned with the Savonarola incident, the great social revolution that swept Florence in the 1490s, a time of great political and financial crisis that included the collapse of the Medici bank. Girolamo Savonarola, a Dominican friar and fire-and-brimstone specialist, rallied the masses to purge Florence of sin by lighting a literal “bonfire of the vanities” on which luxury goods would be burned—very much including artworks. 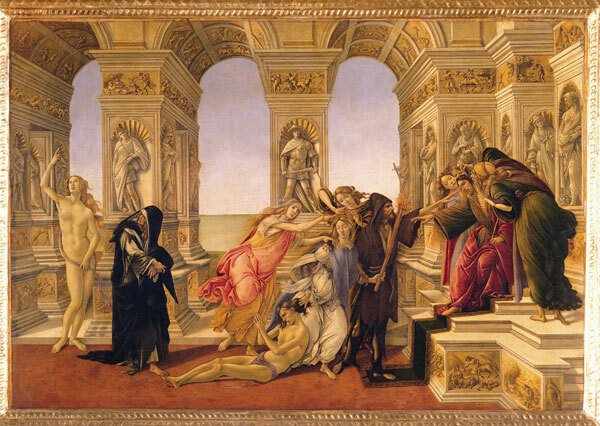 Many artists, including Botticelli, became followers of Savonarola, and some of them (not including Botticelli) cast their own works onto the flames. For Savonarola, the sensuous beauty of Florentine religious painting was no way out of the money problem. One of the most interesting parts of the Strozzi show is how it chronicles the stylistic changes Botticelli went through as he sought to make his art more austere and fit more closely into Savonarola’s anti-aesthetic. While the terms of the debate have changed, art and money still dance together intimately and awkwardly. Viewers of this exhibition will be reminded that while religion has nothing to do with it anymore, we continue to be uncomfortable with what we now prefer to call “the commodification of art.” Instead of bonfires, we have art-market crashes and critical re-evaluations.